Great homemade pizza starts with a great crust. What I really love about this recipe is that it is the same for making thin crust, pan pizza, or even calzones. If you want a crispier crust, prebake it. If you want a softer crust, add the toppings and than bake. For thin crust preheat your oven to 425 degrees Fahrenheit. For pan pizzas and calzones your oven is set to 375 degrees Fahrenheit. For tossed style crust preheat to 425 degrees Fahrenheit. Grease whatever pans you are using. In a large bowl, combine 1-1/4 cups flour, yeast, and salt. Add the water and the oil. Beat well by hand or a mixer until everything is incorporated well. Gradually add most of the rest of the flour and stir it in. 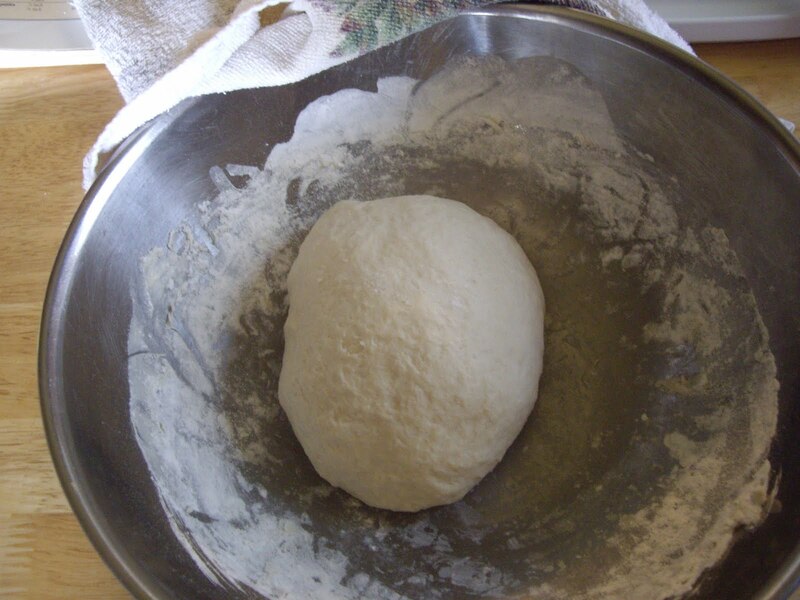 Turn the dough out onto floured counter and knead and work in enough flour to make the dough smooth and elastic. If you are making the tossed style, leave it in one piece. Otherwise divide it in two. Let the dough rest for ten minutes, covered. For the pan pizzas, pat the dough into the pans and halfway up the sides. Cover and let rise til double about 45 minutes. For a crispier crust, bake in a preheated 375 degree oven for 20-25 minutes . Add the toppings and bake an additional 15-20 minutes or until bubbly. For a softer crust don’t bake the first time. Just add the toppings after it rises and bake for 15-20 minutes. For the thin crust, add some cornmeal to the greased pans if you want. Roll each portion into a 13″ circle and transfer to pans. Build up the edges slightly. For a crispier crust, put into a 425 degree oven for about 12 minutes until brown. Bake for another 10-15 minutes until bubbly. For a softer crust do not prebake before adding the toppings. For calzones, roll each portion into 13″ circles and transfer to baking sheets. Add toppings to half of each crust. Moisten the edges and fold over to seal. Prick tops of crust with a fork. Bake in 375 degree oven for 30-35 minutes til crusts are brown. For tossed style crust, press the dough into the pan. Add the toppings and bake in a 425 degree oven for 15-20 minutes til bubbly.